Prince Edward Island, or what many people refer to as PEI, is for us the most an alluring, picturesque, environmentally friendly, and warm place you can think off. We were lucky enough to celebrate Canada Day, 1st of July there. We spent two weeks in total on the Island. Prince Edward Island, or Isle St.Jean is known as the "Birthplace of Confederation", because in the capital city, Charlottetown, is where the idea of Canada was born in in 1864. That did not mean that PEI was going to join the Confederation in 1867 when it was actually formed. Prince Edward Island - Life is a beach. PEI had a few different options that they considered: staying a British colony, becoming its own country, or joining the USA as the northern most state (at that time). Finally in 1873 Prime Minister John Macdonald bribed PEI to join the confederation of Canada by paying off its substantial railroad construction debt. The Province of Prince Edward Island is the smallest province in Canada with 5,683 square kilometers and around 142,000 people. The island could fit into Lake Ontario, three times. Vancouver Island is 5.6 times larger then PEI. PEI is very environmentally conscious. In 1976 they banned aluminum soft drink containers until there was a proper way to re-cycle them. That ban was lifted in 2008. PEI is so forward thinking they even have compost bins with the recycle bins in campgrounds and public places.... Way to go PEI! Wind farm on the North Cape. The landscape is just so..... beautiful! The North Cape of PEI (the most Westerly part) is one of the windiest spots in the country and what a better place to have a wind farm. The wind farm generates 18% of PEI's power requirements. Located at this most northerly tip of the island is also WEICan, the Wind Energy Institute of Canada. The WEICan mission statement "WEICan advances the development of wind energy across Canada through research, testing, training, and collaboration". If you are interested in wind farms etc. this would be a must visit. Not only is the country side beautiful, it is a technology that we should know more about it and have more of it in all of Canada. PEI was the first province to implement the prohibition in 1901, it was also the last to repeal it in 1948. Talking about alcohol, there is a great distillery on the north east part of PEI called Prince Edward Distillery. Anders thinking....... I could have one of these on Cortes! Mmmmmm, nice still. I could distill some miscible or immiscible liquid mixtures.... ethyl alcohol, that's it. They make some wonderful products, one being a Blueberry Vodka. This Blueberry Vodka is made with wheat from PEI and blueberries from PEI. Yes, yes, they do have a potato vodka, wonderful. After a while you just can't stand it anymore, and you just have to clean the beast. Oh well, it is not so bad, actually quite enjoyable. 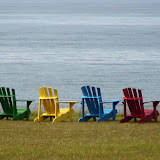 During our two week stay on PEI we stayed at Prince Edward Island National Park - Cavendish and at Cabot Beach Provincial Park. Both of these parks have campgrounds and they are both great and have full services. The beaches are fantastic at both of the parks. We made several different trips to just about all parts of the Island. We chatted with friendly people everywhere. We picked up some locally made cheese, baked goods and Island produce. Cheese Lady's Gouda Cheese..... it's so good. Some days you can even get cheese curds. I got some garlic curds, what can I say, they are to die for. Gouda Cheeses of all kind of flavours. PEI is famous for its fresh seafood, and you can take in one of the local "Lobster Dinners", many sponsored by churches. You can order a 1-4 pound lobster, and with that you get all you can eat seafood chowder, all you can eat mussels, all you can eat desert..... I looked like the Pillsbury dough boy coming out of there. Lucy Maud Montgomery and Anne of Green Gables are still a big hit on the little Island. There is Green Gables that and Montgomery this.... even the Federal Government is making money from the author and the book. Good for them all, milk it for all it is worth. Anne of Green Gables was rejected by four publishers before being accepted for publication in 1908. The arts and crafts on the island is alive and well. Liz dragged me through every shop in the little province.... well almost. I think we need an extra trailer behind the 5th wheel to get it all home. Music is a big part of PEI, if you go you have to take in one of the local Ceilidh at one of the halls. Ceilidh is a gathering with some local musicians and some time some dancers. Origianlly Ceilidh was a traditional Gaelic social gathering, often in the neighbour's kitchen, which usually involved playing Gaelic folk music and dancing. We went to one of these gatherings and it was just fantastic. There are some short movie clips in the photo albums. Here is a sample. PEI potatoes are really good, ask for them next time you are to your local grocer. 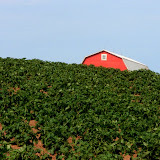 1/3 of the potatoes grown in Canada are grown on Prince Edward Island. They also have a way with words. A sign outside a local business in PEI: "A man who eats many prunes, gets a good run for his money"
Real estate on PEI is still very affordable in comparison with Victoria, BC. You can get a house for $100,000 and if you want to go fancy, you can get a brand new ocean front condo in Summerside for around $400,000. Similar unit in Victoria would be over 1 million. The capital Charlottetown is a wonderful quaint town. It has all the amenities you need, a great airport with direct flights to Toronto. Around 32,000 people make their home in Charlottetown. This is where the current PEI Government shoots the breeze. There are many wonderful places to eat. One of those special places is Water Prince Corner Shop in Charlottetown. The seafood chowder is one of the best, no doubt about it. Life is good..... the chowder is on it's way! 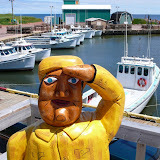 As you can tell, we all really liked this wonderful place and province of Canada called Prince Edward Island. We have tons of pictures, check out the albums below or click on the following slide shows: Ceilidh, Drive to North Cape, PEI, Caboht Beach Provincial Park or East Point, Gouda Cheese, Aqua farms, Greenwich beach or Green Gables, PEI beaches, washing the rig.